Today was a hiking day. 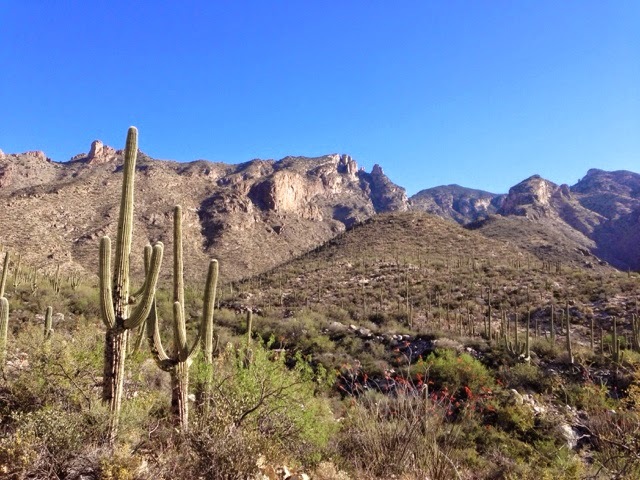 The cold front came through yesterday with high winds, so today it was only going to make it to 70 in Tucson. In the mountains it was near 50 when I started the hike and in the 60's on the way back. On the way up you hike in the shade so it was very cool. 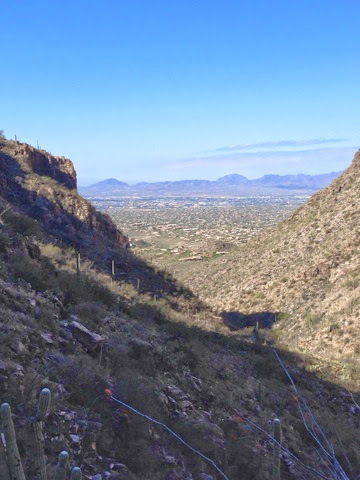 This is the mountain range north of Tucson where Finger Rock Canyon Trail is, kind of in the center of the picture. I selected this trail as it it was an aggressive hike that will push me, and push me it did. I arrived at the trailhead at 8:00. This is a long hike so if your planning to go to the top you need to start early. There were a half a dozen cars in the parking lot that holds about 30 cars. This parking lot is also used for a smaller trail too. As with other trailheads I have been to, they are in residential areas and there is no on street parking. I would recommend that if you were arriving on a weekend you should plan on arriving by 7:00. This is the street and the trailhead parking is on the corner at the curve of the road. 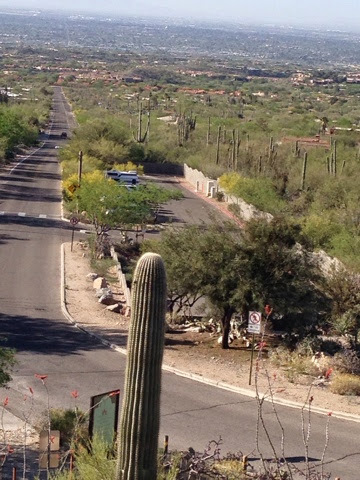 View is looking south to Tucson. 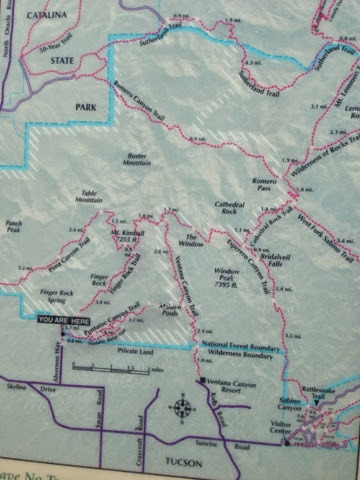 The trail looks small on the map. Even short. It is far from that. Listed on AllTrails as 8 miles out and back with an elevation gain of 5280. 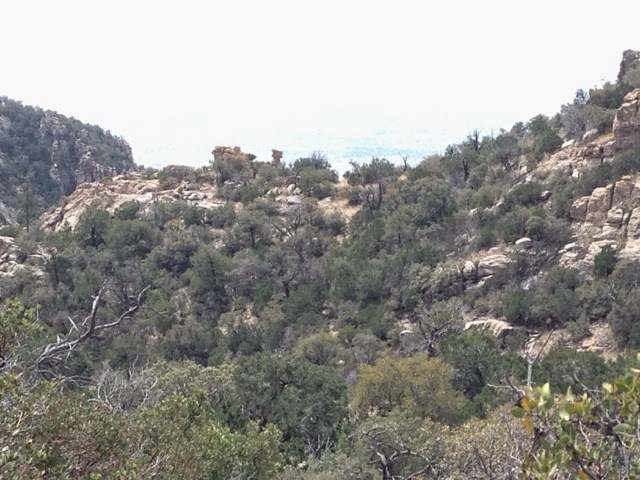 This is just under the Grand Canyon elevation from the ranch up the trail to the south rim at the Lodge. If you can hike this you are possibly ready for the Grand Canyon. Thos climb is not for the novice hiker. I met 3 woman hiking down then 2 other woman hiking down that had hiked out 2 hours and turned around having not gotten even half way to the top. The hike starts off with a slight incline for some distance before it turns to the canyon's right (east) side and gaining elevation quickly. I have worked up to his hike and I felt I was ready and I was. The hike was in the shade for a good amount of time going up. This helps with not overheating on the way up, even though I still sweat with just a tee shirt on in the 50's. When I stopped to talk to the two woman one was cold, not having planned for cool weather. I got chilled as I had sweat thrill ugh the back of my tee shirt. 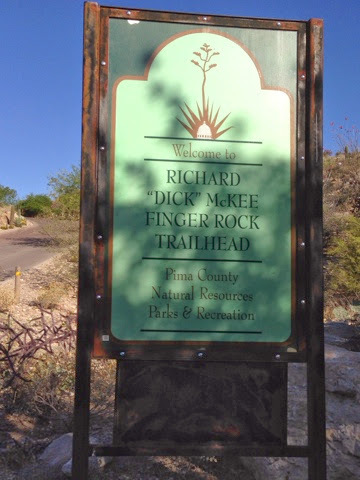 Here is Finger Rock in the center. 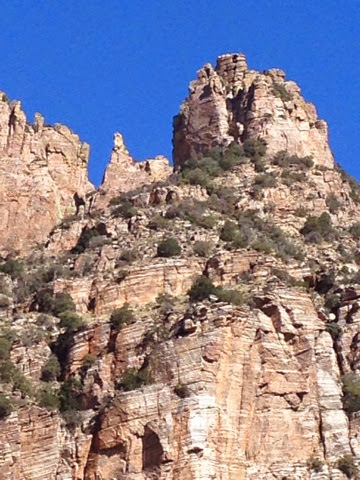 You can see this all the way up rhe canyon until you get to the side view blocked by the formation on the right. Still getting higher in the canyon. This is about 2 hours of hiking into the canyon. 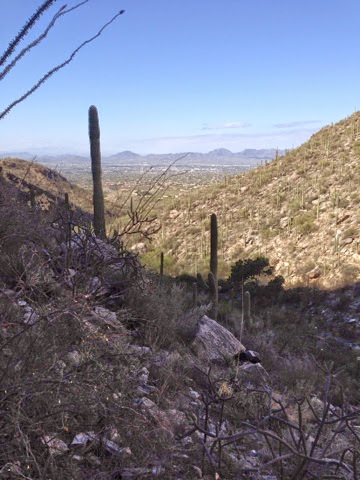 In the distance you can see the mountain range where I hiked Wasson Peak. Here I am approaching the point where I will not be able to see Finger Rock on the way up to the saddle. 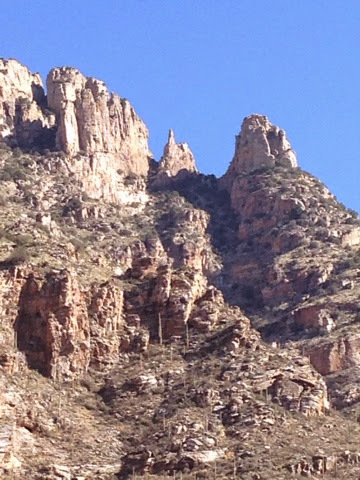 Below is the saddle in the center that connects both sides of the canyon. I am now 3 hours into this hike. I hike another 1/2 hour to the top. 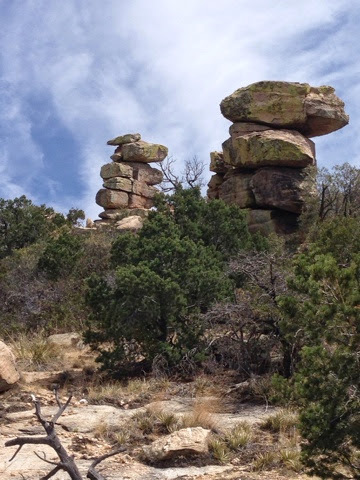 Rock formations on the side of the saddle. View back to the city. I hiked 3.5 hours and there is a number of spots where you have to use your hands to get over rocks. I hadn't seen anyone since the woman that turned around. That was 1.5 hours ago and much of the time there was no cell service. Thinking toy self that they don't recommend you hike by myself. Doesn't give me many options if I want to hike so I take some risks. I was out here by myself and it was now 12:30 and I know that it will take me about the same amount of time to get down due to the rough trail conditions. 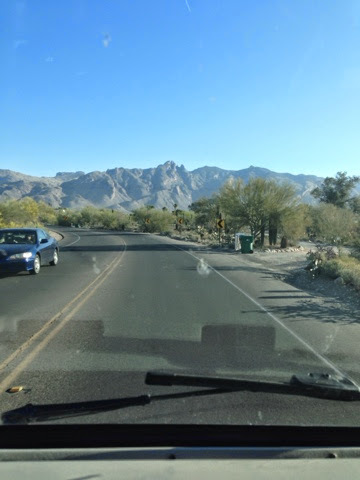 I am at the top of the saddle and there is about .5 mile trip to get to get to finger rock. This is about an hour of hiking one way and this would get me back late and since the saddle is nearly the same vertical elevation I met my goal for a strenuous hike and I turned around. It was another 2.5 hours before I saw another person. That was 4 hours being all alone. 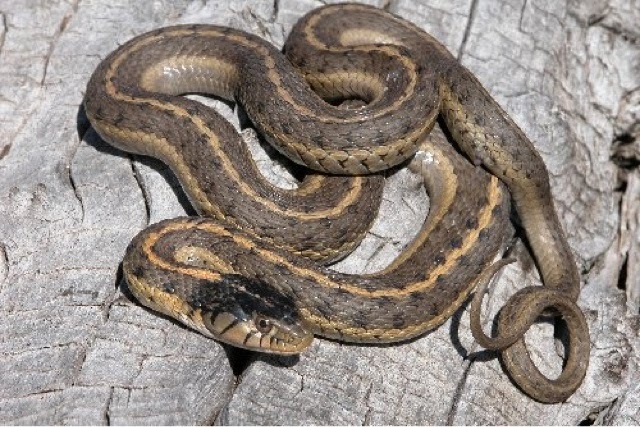 With the afternoon sun now shining on the on the trail, I did see 2 snakes that were the same type within a short distance. They were Wandering Garder Snakes. Non venomous snakes. They scurried off as I scared them stepping over the rock going down hill. 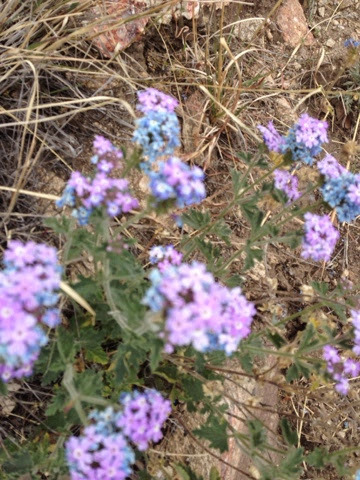 I scared them and they startled me, as I was looking out for rattle snakes. I liked this flower as it had two distinct colors. 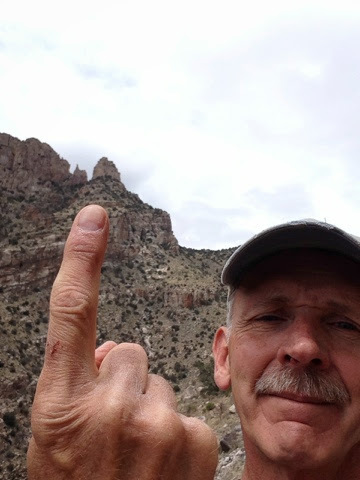 Here I am giving Finger Rock my finger. You can see a cut on my finger thanks to a cactus that jumped out and stabbed my finger. 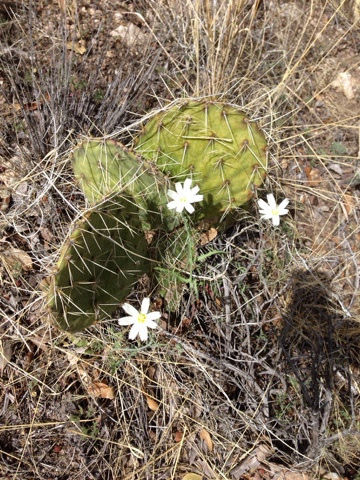 On the other hand I was stabbed by a different type of cactus in the knuckle. 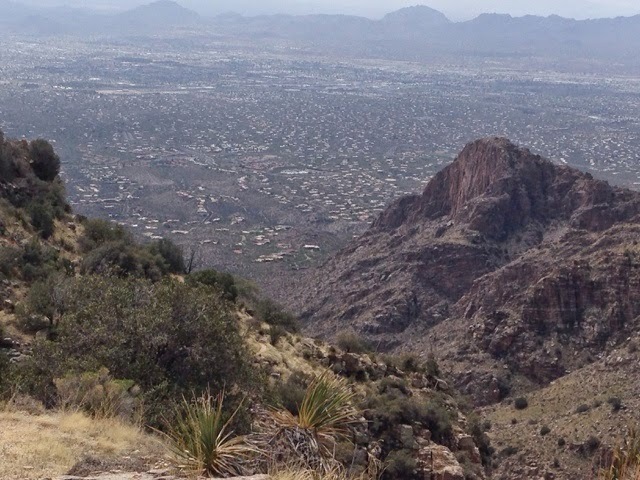 The other day when I hiked Wasson Peak I wore my 6" high hiking boots. This was a 7 mile hike with much less elevation and when I got back both inside heals were hurting. I have not had problems with my trail shoes that are a lower cut so I wore them today. They wore well but near the end the balls of my feet on both sides were sore from getting some sand grains in the shoes. I need to get out my lightly used stiff sided hikers to tryout when I get home. Tonight as I write this I have mussle cramps in both thighs. Ouch! This is a first on this trip and I think it was due to the extensive number of rocks that I needed to climb over today on the trail. Having long legs I lifted my legs and pushed off and up and over the rock thus working the thighs on this hike. As noted before this hike is not for the novice. My legs held out well and I did not suffer significant fatigue in my legs. They were getting tired but they were not worn out and could have gone further to the Finger Rock. I had my 2 liter camel pack full with water, and I carry a spare bottle of water. My rule is that once my 2 liters are gone I'm headed down and I have at least one bottle to get me out hydrated at some level. I used all my 2 leters on this hike and had my bottle left, but this hike tells me that you should hike with at least 4 liters and I saw one post saying 6 wasn't enough. The temperature could be the difference. If you are hiking plan for plenty of water. I am thinking I should have a second 2 liter camel pack for these long hikes rather than supplement with bottles. Check out AllTrails website and comments others have posted on this hike.